Trekking in Bhutan is extraordinary from other parts of Himalayas. Bhutan offers lots of opportunities for trekking with its splendid scenic beauty, lofty mountains and deep valleys untouched by modernization. Trekking in Bhutan Himalayan kingdom is a wonderful experience for any one who enjoys hiking and camping in rich natural habitats, meeting indigenous people and their cultures. Bhutan trekking tour through the country side opens up a vistas of the sub-tropical forest over a high alpine passes and broad valleys with impressive Dzongs, and colorfully painted houses. Scattered all over the landscape. Also comes over exotic flora and fauna not seen anywhere else in the world. Here it is for serious trekking adventures, the trek range from low altitude (9,500 ft) to medium (10,500 ft) to very high (16,000 ft). Bhutan offers many opportunities for trekking with its splendid scenic beauty, lofty mountains and deep valleys untouched by modernization. The country ranges from the dense forest of subtropical jungles to the alpine shrubs, endowed with a wide spectrum of Himalayan flora and fauna. The land is thinly populated with scattered settlements. Bhutan is an off-the-beaten-path destination, and trek steps even further into this magical Himalayan kingdom. We offer adventure trekking in Bhutan consent to enough time to immerse yourself in the mountain culture and offers spectacular Himalayan scenery with memorable in lifetime. Bhutan is one of the most exclusive and rare destinations for travelers / visitor. The unique culture, architecture, lofty snowcapped peaks, fortress like dzongs, Lamaist Buddhist traditions and its friendly people leave an everlasting impression on the visitor. Himalaya Journey Treks & Expedition Nepal arranges all type of trekking in Bhutan with co-operate Bhutan trekking and travel agency as it is required operate for Bhutan trekking through a registered Bhutan trekking agency. HJT has depth experience to operate the all Bhutan trekking tour since Bhutan has been open since 1974 including Bhutan Chomolhari trekking, Bhutan Druk path trekking, Dagala thousand lake trekking, samtegang trekking, Chelela nature trekking, Lunnana snow man trekking, Dur Hot Spring Trek, Gangtey valley Trek, Bumthang Cultural Trekking, Bhutan Laya trekking etc with friendly trekking guide and staff. All our treks are full service operations. 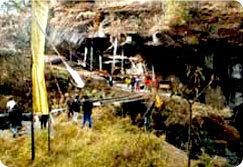 Our trained guides and trekking crew accompany the group throughout the journey. Pack animals, ponies and yaks, take care of all the “heavy lifting”, carrying all luggage’s, provisions and equipment, leaving the trekkers with only a light daypack with camera and other personal items needed for the day. Everyday, the trekking support staff walks ahead and pitches camp before the trekkers arrive, and our well trained cooks prepare excellent meals. October-November and March –May is the best season for Bhutan trekking.